Now that you have installed JungleDocs and have activated the features, you can start using the app. At the end of this tutorial, you will have learned how JungleDocs works and how you can start creating documents. Document templates form the foundation for the documents you create using JungleDocs. Document templates are only partly filled with content, with some spaces left blank. 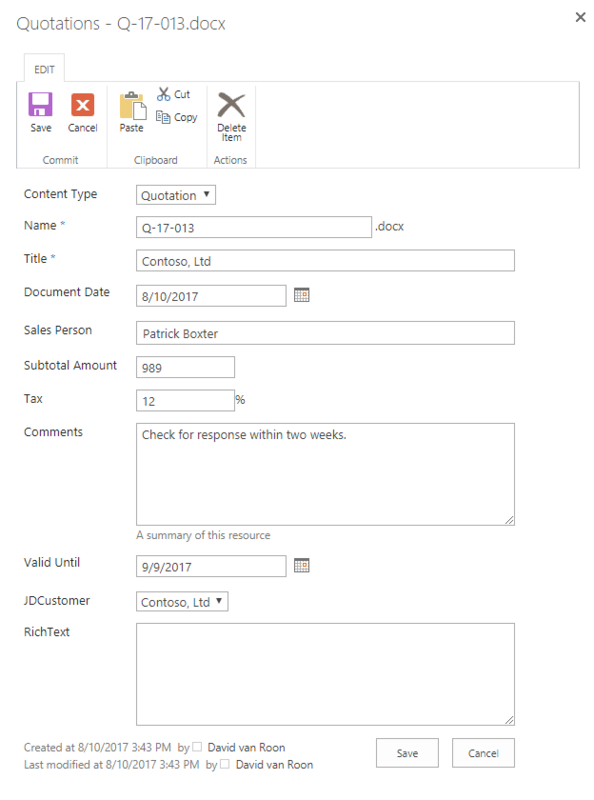 You can then use JungleDocs to fill the blank spaces in your templates with data from your SharePoint and other documents. When these blocks that you fill your template with contain a lot of information and come from different documents, we call them Small Parts. When they are simple things such a name of a person you are addressing in a letter (e.g., Dear [First name]), we call them placeholders. These help you quickly create new and unique documents. JungleDocs Rules are used to create items and fill document templates. In other words, a JungleDocs rule is a command to create a specific document or list item. Base rules let you create documents or list items. They are also the foundation for all other rules. From Existing rules let you use the metadata of a selected list item to create a new document or list item. Report rules let you export multiple list items into a document. This rule is especially useful for report creation. 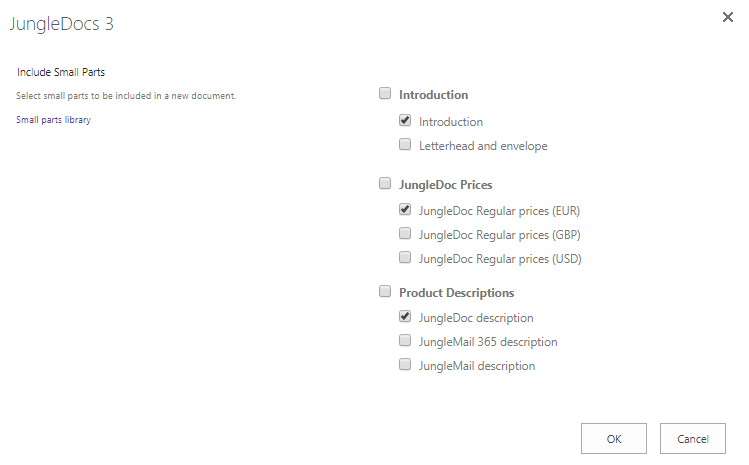 There are three types of document creation available in JungleDocs. To use any of these simply navigate to the list or library that contains the documents or items you are working with and open JungleDocs from the ribbon. If you are reusing data from the List or Library then select those items before opening JungleDocs. Run the rule and your new document will be created. To exemplify what is discussed above, we will now move on to put the knowledge to use. In this example, we will create a quotation for a new client. 1. First, we navigate to the SharePoint list where we store companies. 2. Now we select the company for which we are going to create a quotation (Contoso). Then we open JungleDocs from the ribbon. 3. We can now select the JungleDocs rule we need. We have already configured the rule for creating quotations, so we will select it here. 4. This rule is pre-configured to use Small Parts. Therefore, once we click on it, JungleDocs will open a menu where we can select the parts we want to be included in the quotation. 5. Once we have selected the parts, we click OK and a new window will open. This window contains the information for the document, its name, and any additional notes. Most of the fields will have been filled in by JungleDocs already, as pre-configured by you in the rule. 6. Click Save and the new quotation will be generated and stored in the selected SharePoint library.